When we chose Atlanta as the next stop for Create & Cultivate, there were more than a few good reasons. 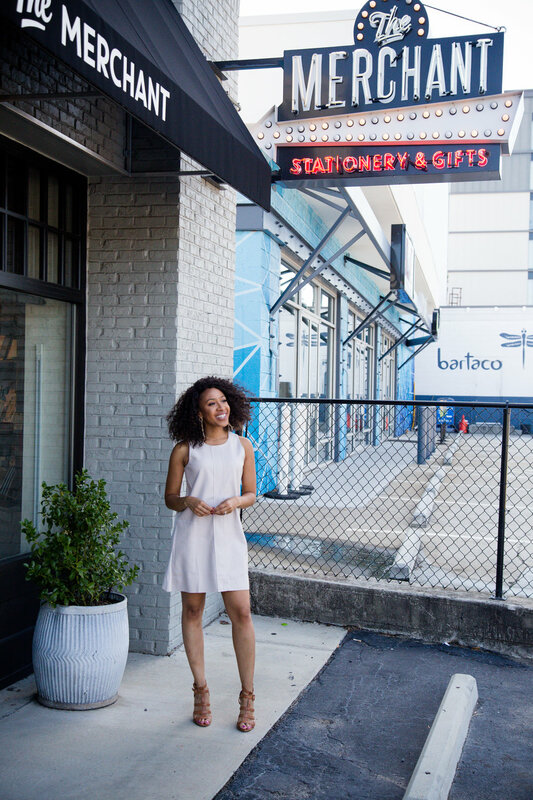 As a growing hub for diversity and tech, Atlanta has also been named #5 in the best cities for female founders with 44.3% of female-owned firms in the city. #nobrainer. 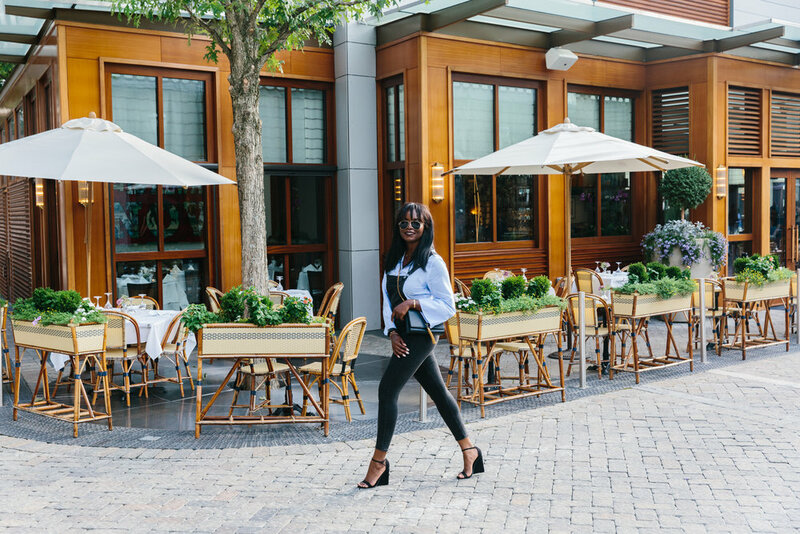 So it felt natural when we headed to Atlanta this past month in partnership with Marriott Hotels to profile female entrepreneurs and business women living in the City of Trees. Like our San Francisco City Guide, each woman is at a different point in her career. Each with a different focus and personal definition of success and balance. We stayed at the Marriott Marquis in downtown (Hunger Games anyone?! see elevator shot above) and explored the city, hit up Barcelona Wine Bar, chatted work/life balance, what it means to have a job that puts you up in the air, and why ATL is the place to be. 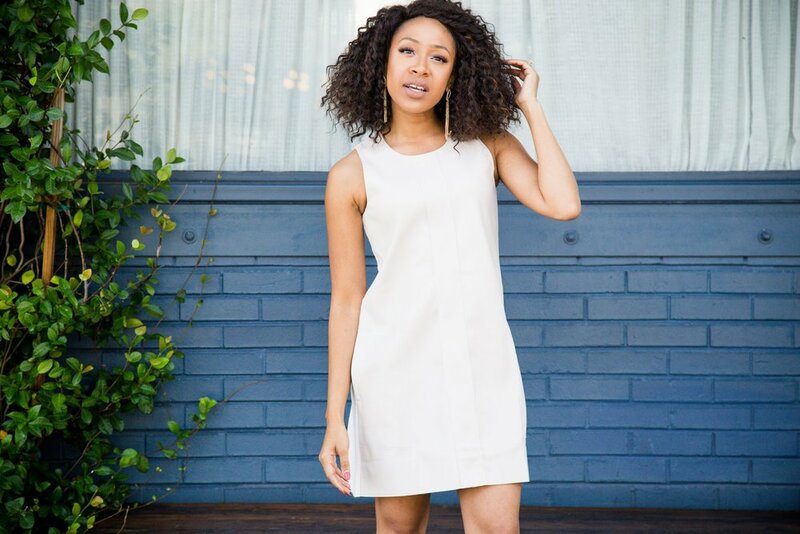 Mattie James, lifestyle and business blogger at Mattieologie has broads in Atlanta. Fans and women who listen and take the career advice she doles our seriously (as they should). When we met up to grab coffee at the brick-lined Octane near Georgia Tech, one woman couldn't help but approach her. "Are you Mattieologie?" she asked with excitement. It was not only a reminder of how bloggers and influencers become their brand-- at least via public perception, but also served as a reminder that dishing out career advice is a big responsibility. Mattie knows this. It's not only something she's "comfortable with" but also says that her "intentions are whole-hearted." She wants her followers and readers to know that "that power will always belong to them. I'm simply just a guide." When she first started Mattieologie she was working a full time job and blogging simultaneously. 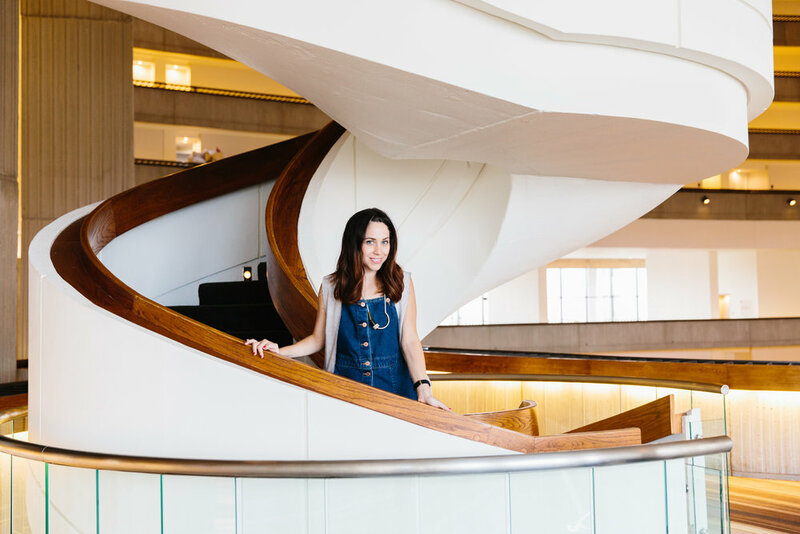 "I think having a full time job and tackling blogging at a full time level is exactly that. Working two jobs. You have to wear the employee hat - where you answer to management or a supervisor - and then the entrepreneur hat where the last decisions are on you." Pulling double duty was something that forced her to be a better blogger. "It made me take myself seriously," she says. "The better version of myself is the only person I'm trying to keep up with." Like many working women Mattie says she "danced around the idea" of leaving her 9 to 5 instead of giving herself a hard deadline. She says she really made the decision, "subconsciously when I had a baby." But then she was "Luckily let go in June 2015 and got really focused." The child of immigrant parents who both worked, Mattie learned plenty of lessons about entrepreneurship growing up. "My mom did Mary Kay for years and was incredibly successful at it. The thing I admired most about her is that she dominated both at work and at home. She created a balance that made me believe you could do it all. My dad has such incredible work ethic which I think he passed on to me and my sister. They made us believe in the American dream." Her sister has also been bit by the entrepreneurial spirit. Today Mattie is a working mom who says that balance means "making it work by any means possible. And that balance looks different every single day. There are days when I'm an amazing mom, fantastic blogger but dropped the ball as a wife. Tomorrow is another day. Hopefully the day you get it right." She calls Atlanta "a city of balance." And is always loving on "the food, the people, and the feeling." Favorite spot to get coffee: Octane off of Marietta St.
A spot in the city that has special meaning to you: Fox Theatre. Where me and Hubs had our first date. Coco Bassey is at the point in her career where Mattie James once found herself. She's working two full time jobs-- what she calls her "professional job" and her "personal brand." It's important to Coco that she succeeds at both. "I've found that working with people who support my vision on both fronts is what has really helped me. My blog is still a solo project, but I have a really supportive family who knows what I'm trying to do." She says she asks herself every day if it's time to focus full time on one or the other but feels like, "everything I've learned in my professional career has really contributed to Millennielle's success. I'd love to keep my double life going for as long as I humanly can... until one or the other takes absolute precedence." As a woman and student of the world, having lived in five different countries, Coco has learned a lot about business and building relationships from being mobile and adaptable. The current secret to her hustle is "no days off," but that doesn't mean it's not a challenge. She also knows a lot about challenge. She started Millennielle during a time of particular hardship. "When I started my blog back in 2013, I was just a few months out from a thyroid cancer diagnosis and treatment," she says. "I had to leave my job out of school because of visa issues, and I was going through a break-up that affected me a lot more than it probably should have — probably because of the former two." She says it felt like "nothing was working for me," but one of her escapes was "admiring the digital spaces girls just like me had created for themselves by way of blogging and/or starting up small businesses." "The most successful women I've known have never played it safe," she says, "which is so inspiring to me, because sometimes I feel like I could do so much more to make my mark! What I've discovered though, is that risks come in so many different forms, so I try not to be too hard on myself and just take things one day at a time. "The most successful women I've known have never played it safe." With Millenielle, Coco's goal has always been "to to be a representative voice of all millennial women" and share her unique perspective. "There's only one me with my own story to tell!" she says. "I'm a firm believer of concentrating on bettering myself and reaping the rewards of the work I put in, instead of focusing on what the next person is doing. I think that's what any business-savvy person does to keep their head above the water — comparison is the thief of joy." Coco didn't take to Atlanta right away, saying "it took a long time for me to fall in love with this city. Growing up in cities like Prague and Berlin I thought living in the South was not for me." And yet, the City of Trees kept pulling her back in and she finally made the decision to "bloom where I'm planted." "You may have to dig a little," she notes, "but there really is so much to love about ATL." Favorite neighborhood and why: This is a tough one, but I would have to give it to West Midtown. It's where most of my favorite restaurants are located and I love that the neighborhood hasn't lost its personality, even though it's right in Midtown! Meet up with other bloggers: Bartaco! Fun cocktails and delicious tacos... who can resist? Go when you want to be with friends: My closest friends live out of town, so whenever I'm looking to have a good girl's weekend out, you'll probably find me at the airport checking in for a weekend getaway! Listen to live music: Although I do love a good music festival, arena concerts aren't my favorite. I love smaller intimate gigs, so The Tabernacle is my favorite! Tisha Thompson didn't start out in the beauty department at PÜR, but in finance. The now VP tells us, " I was an Accountant at the company in the early stages of PÜR getting started. At the time I was a freelance makeup artist doing weddings and music videos, etc and one day shared my side gig with management and much to their surprise they said hey lets give her a shot on the marketing team. I then shifted over right as PÜR was in the middle of 6 test stores and now 4000 stores around the globe later I am so excited to be apart of such an amazing brand and team." She has a proven track record of driving profitability while implementing innovative beauty solutions in a saturated market place-- innovative being the key word. She understands how important it is for a brand to be able to pivot and shift. "PÜR has really reinvented itself in the last year," she says. She's talked about getting the "branding right," which for Tisha means "staying relevant while staying true to who you really are. For us at PÜR it's so important to not chase the next 'trend' and try to be the most 'trendy' brand but is it important to be on trend." It's a fine balance, but a challenge she's up for and once she understands has to include social responsibility. "I recently read a stat that said 58% of women started wearing makeup before the age of 18," she says. "With so many women starting to wear makeup at such a young age I think its critical that we remain socially responsible as a brand and provide the best high performance products that are the very best for your skin. Being socially responsible and helping women feel beautiful as we say one compact at a time will naturally lend itself room to be apart of women's day-to-day and therefore a critical part of their lifestyle." "With so many women starting to wear makeup at such a young age, it's critical that we remain socially responsible as a brand." 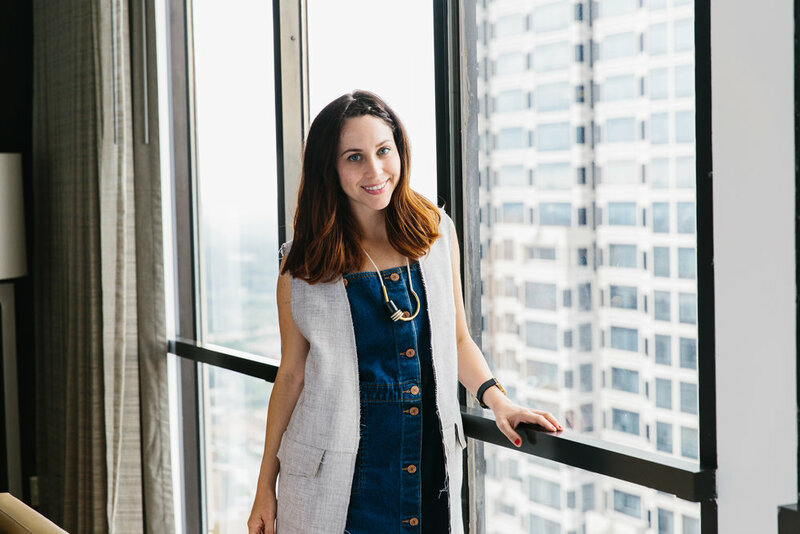 When it comes to Atlanta as the HQ for PÜR, Tisha has this to say: "Atlanta is such an inspiring city. What I love the most is that it’s a very diverse city and so much like the PÜR customer we are able to serve so many different kinds of people of all different races and skin tones. As the complexion authority we have products for all women." Favorite spot to head after you’ve gotten your makeup done: I love getting dolled up when I go out to any of the many events always happening in Atlanta. PÜR is the official makeup sponsor the Atlanta Hawks Cheerleaders and the Atlanta Falcons Cheerleaders and so I love to attend the games all dolled up so I can tell people this is what the cheerleaders are wearing. Go-to spot in the city when you need to relax: Relax what is that? I always say I will relax when I am dead. But if I ever need a moment I generally go and get a massage. There are so many good ones but I particularly like Spa Waverly at the Renaissance Atlanta Waverly Hotel. Favorite location to have a glass of wine: It’s a little out in the burbs as we say but it's amazing. It's called The Gifted Ferret located in Woodstock, GA. They do FREE wine tastings every Saturday and I really enjoy going to learn about new wines. Guilty pleasure “tourist” spot: The Georgia Aquarium. I really love to go and take family or friends that come to visit because it's really spectacular. The one thing about ATL that lives up to its reputation: Nightlife & Music. The night scene is a very vibrant in Atlanta. There is always somewhere cool to go and listen to great music and have a great time. Best spot for coffee: Café Intermezzo. I love the vibe! Best spot on a Sunday: Sunday is reserved for family time. I love to go for walks with my family and just enjoy the day. For more than 16 years Lynnette Cole has been a beauty expert and TV personality, working to empower women to be their best selves. 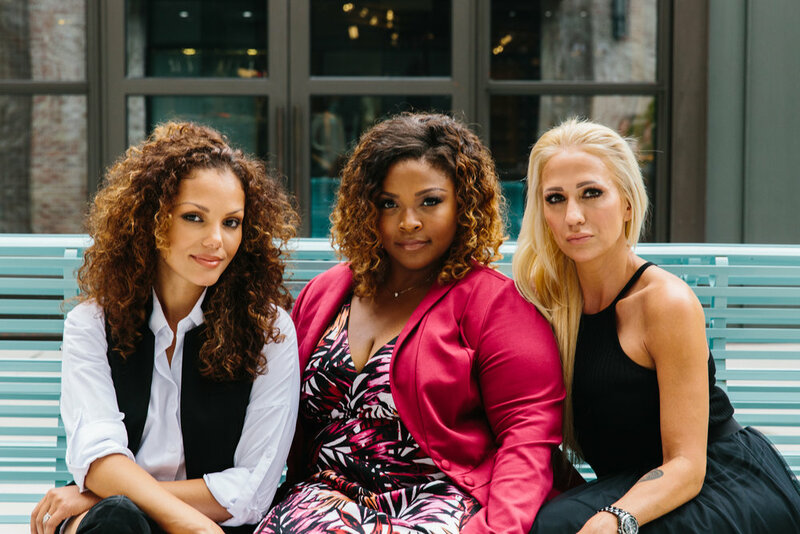 She never expected to be in the beauty industry, but the former Miss USA 2000 is now focussed on on being a global ambassador and makeup educator. "I didn’t have any 'makeup experience'," she says, "but I have always had a love and passion for beauty." "Growing up my parents always told me, you can be and achieve anything you put your mind to. I’ve always known that I wanted career that combined my passion & drive to make a difference and I’ve always known that I wanted to work for a company that invests in training and growth. In many ways PÜR “ticks” all the boxes." "Growing up my parents always told me, you can be and achieve anything you put your mind to. " "Since I’m not one to be still," she says, "the beauty industry is a good fit because it’s constantly changing and evolving. Being a part of the PÜR team has been a great training ground in so many was, being able to travel to different countries doing what I enjoy is a bonus!" PÜR's home base is in Atlanta, but Lynnette lives in Florida and travels for the company. When we met up she was about to go wheels up to Australia. "For me," she says, "traveling has always re-energized my creativity and inner spirit. Being a global brand, it’s important for us to travel and connect with our PÜR Beauties around the globe! Travel also provides invaluable insight, education and hands-on learning." That's not to say jet lag and long flights don't take their toll, but there are ways Lynnette manages to #travelbrilliantly. "The one thing that helps me adjust to a 15-hour time difference is adapting my 'home' routine to my travel routine. I get up at 6am, no matter where I am around the globe, exercise and drinks lots of water! But I must give credit to my amazing team! Without them, I’d be a mess!" 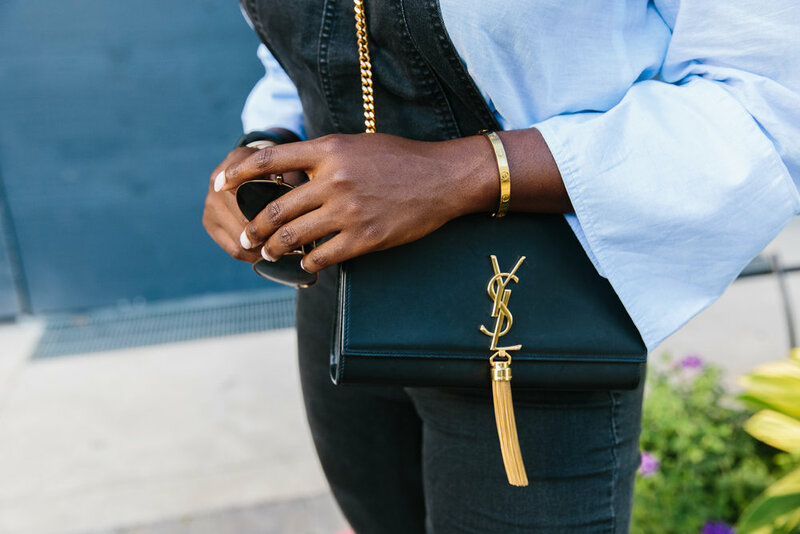 As an entrepreneurial woman on-the-go Lynnette advises young business women to "keep educating yourself and broaden your social and intellectual reach by reading, listening to podcasts, watching documentaries, networking and having a mentor. There is so much to gain from someone else’s knowledge and expertise. AND be generous with your success by mentoring and lifting others. "Success is happiness," she says. "Becoming successful is a combination of hard work, preparation and opportunity. Maintaining success is like a relationship, it requires attention, care, nurturing and respect." "Maintaining success is like a relationship, it requires attention, care, nurturing and respect." The first spot you go when you fly in from Florida: My first stop is always the office! Favorite spot to head after you’ve gotten your makeup done: I think anytime you pamper yourself and get your “makeup done,” you instantly feel a little pep in your step! I always tell my clients, “don’t waste this look (makeup), call your friends and go out for at least a cocktail”! Personally, I love treating myself for a blow-out at Dry Bar! Go-to spot in the city when you need to relax: Wherever my friends gather! Recently it’s been Hearth for some “guilt free” pizza! Favorite location to have a glass of wine: I love trying new places. I’m really excited to try the new French Bistro Le Bilboquet! The Le Boeuf Bourguignon has my name all over it! The one thing about ATL that lives up to its reputation: Being raised in Tennessee, I appreciate Atlanta’s southern charm and I love the food! As the National Sales Director, Heidi Davis brings PÜR over 25 years of prestige beauty and skin care experience. She's mother of four but also travels for work. Like Lynnette home base for Heidi is not in Atlanta, but she flies in from Ohio. Of the constant movement Heidi says, "I am a gypsy by nature. I have lived in NY, Miami, Orlando and Atlanta before settling in Ohio to raise my family. Traveling keeps me sane." Her trick for managing travel days and jet lag is "work," but she says she "often won't buy the in-air wifi so people can't reach me, but I can respond to them." "I easily bang-out 100+ emails if they aren't coming back in. I take mild amusement knowing when I do connect that my team gets 50 emails in five minutes. Is that a little twisted?" she laughs, "I have to keep them on their toes." She says that traveling and "being in the air 50% of my time teaches you a lot. You learn to maximize on your time. Prioritize and put first things first. You know to pack light and to expect the unexpected. I have a mantra - a delayed flight is the universe's way of slowing you down and saving you from something, sometimes yourself. "I have a mantra - a delayed flight is the universe's way of slowing you down and saving you from something, sometimes yourself." She's worked for what she calls "uber-hype brand Urban Decay," but made the decision to leave after the birth of her second baby ten years ago. "I was the National Sales Director," she says, "and was beginning to feel that Urban just wasn't my lifestyle anymore. Brands are a lifestyle. Your career is a huge part of that lifestyle. I wanted to be part of something that was more me. A brand that was healthy, good for you, with great messaging that empowers women and addressed real life beauty concerns. Representing green eyeshadow called Acid Rain just was no longer "my thing". Of the company Heidi says, "We are a true family at PÜR. We leave no man (or woman) behind here. It is a rare and beautiful thing." The first spot you go when you fly in from Ohio: Typically for coffee. I get on the earliest flight into town so this is a must. We don't have Caribou Coffee anywhere near me in Ohio and it is a lovely change of pace from Starbucks. Where you go to recharge: As a frequent traveler I love to recharge at those crazy little massage kiosk things they have in the airport. I will take a massage everywhere and anywhere I can. Atlanta airport by the way is one of the best in the country. Shopping, food, etc. Favorite spot to have dinner with a colleague: We all love and frequent South City Kitchen. I am a huge fan of shrimp and grits so this is a must for me. Favorite spot in the city to meet someone new: Chops Lobster Bar is a great place to socialize and I have always had a great time at The Tavern at Phipps. Their Tavern Chips are fun to share over a few post work cocktails. Secret guilty “tourist” spot pleasure: Tourist spot...You have to go to the Georgia Aquarium. It's amazing!! Favorite ATL neighborhood: Buckhead. I can shop, eat, and see my secret celebrity crushes all within a few miles of each other. Best place to grab a great bite when you’re in a hurry: I don't care what anyone says... Chick fil A biscuits with cheese are amazing and I could eat them daily. My fast and furious guilty pleasure. The one spot in ATL you’d recommend to anyone: Breakfast at The St Regis - It's the St Regis, need I say more? Create & Cultivate is visiting 4 more cities across the United States in partnership with Marriott. For our next city, we're heading to Miami. Can You Afford to Take an Entry-Level Salary?